Mama Mo Stamps: Hello Spring Blooms! It's finally feeling like Spring in our neck of the woods. The trees are blooming, the birds are chirping...it's about time already... it's almost Summer (haha!) which we got a taste of this weekend at the beach and I am so ready for it! If you are looking for a quick and easy to mass produce card set, this is it!! Spring Blooms is the perfect set for making note cards. I love the variety of blooms available within the set. I decided to use two sizes of the same flower, but you can mix and match too. I didn't get crazy about perfect placement here, I just stamped randomly. To get a balanced background when stamping randomly, stamp your images in a triangle (notice how the flowers create triangles), then fill in with the extras like greenery and berries until the background is balanced. Hand Lettered Hello is stunning as a stand alone sentiment. I think this card fits in perfectly at the Simon Says Botanical Challenge! Thanks for stopping by! Lovely card, perfectly executed. I love the crisp, fresh style. Thanks for joining me for this week's Simon Says Stamp Monday Challenge! 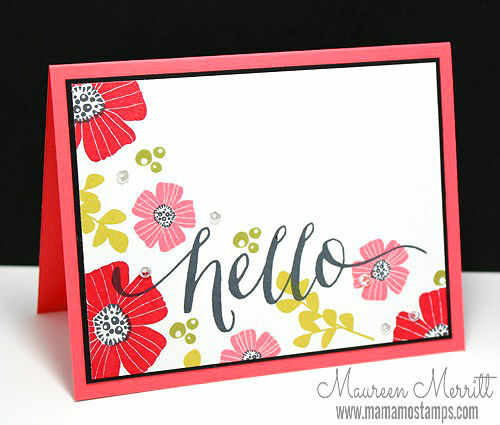 I love, love, love your stamping Maureen! This card is absolutely fabulous as always. Love this card Maureen! Fantastic flowers. A BIG Change to the CAS Classroom at StampNation! StampNation teams up with Penny Black! Wish Big & the Cards For HIM winners posted!